Collaborators’ Q&A: Artist Elizabeth Terhune: Inspiration. First, mantis. Drawn up short, abruptly, thought’s space interrupted, invaded, to fixed attention, hearing: mantis. Synonym: mystery. Ghost Mantis. Doubles that. 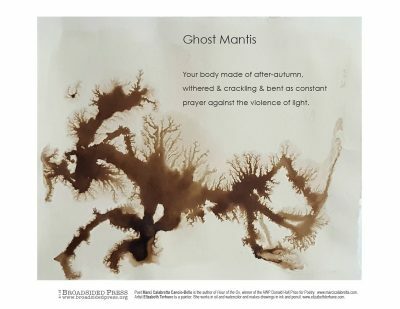 Poet Marci Calabretta Cancio-Bello: I’ve always thought of this poem as a bit scrappy, but when I saw the precisely smudged and veined edging of the mantis shape, I couldn’t help thinking of that last line as empowering and beautiful for both the mantis and the reader. Collaborators: Poet Marci Calabretta Cancio-Bello is the author of Hour of the Ox (University of Pittsburgh, 2016), winner of the AWP Donald Hall Prize for Poetry. Artist Elizabeth Terhune is a painter. She works in oil and watercolor and makes drawings in ink and pencil.